The confluence of social media, video on demand and binge viewing has people talking about what they watch more than ever, but with that, comes a great storm of spoilers. People have been complaining about spoilers – hearing details of plot twists and other narrative developments before you’ve seen the movie or show in question — for years, even back to the days of Usenet discussion groups. But the recent series finale of Breaking Bad brought a flurry of warnings from people who couldn’t watch it when it aired — and didn’t want to hear how it ended before they saw it themselves. CBS News even pondered a statue of limitations on spoilers recently (48 hours after a live airing, or once a series is off the air and the hype has died down were two suggestions). The story also advises the unspoiled to stay off social media — which is not so easy to do for some because you get a lot of other news and information besides those about your shows. So what do you do? You don’t want to be spoiled, but you don’t want to give up your personalized newsfeed or possibly miss some high-school gossip on Facebook. Enter the Twitter filter. Several people have had the idea – to write filters for Twitter that block certain keywords, like the name of your favorite shows. A 17-year-old girl, Jennie Lamere, even won a hacking contest last spring with her Twivo app, a spoiler blocker for Google Chrome. Netflix, which is showing earlier seasons of the show, even went so far as to put up its own Spoiler Foiler page, where you could log into your Twitter account through the site and have any tweet mentioning Breaking Bad get blacked out. 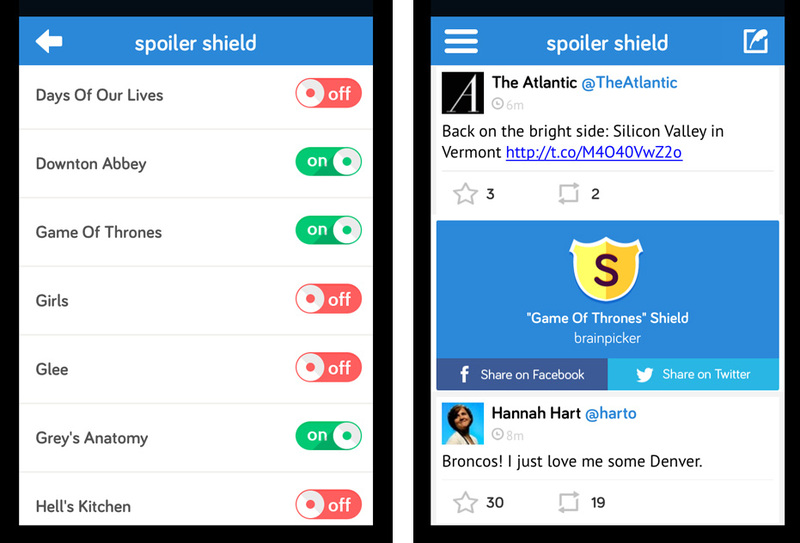 And for those who watch a lot of shows, including sports, there’s Spoiler Shield. The free app, which is available for iOS and coming soon to Android, has filters for 30 popular shows including Scandal, Grey’s Anatomy, Game of Thrones, Homeland, Mad Men and Downton Abbey. The app also has newsblockers for all the National Football League and Major League Baseball teams, in case you like to record games and don’t want to hear the score before you get home to watch. Once you install Spoiler Shield, you log into your Twitter and Facebook accounts through it and have your feeds filtered according to your preferences. You can still tweet and post to your page through the app, and if you want to read a shielded tweet, just tap on it. These may not be all the spoiler-squashing apps out there, and they may not be for everybody, especially those who don’t like logging onto their accounts through other apps. But for those who don’t mind, you have more options now besides going the full Amish or getting constantly peeved at your friends for discussing current cultural events that are still unwatched on your DVR. “Breaking Bad” rides off into the desert sun leaving El Kaiser wondering how it fared against other famous TV series swan songs and J.D. fills us in on the quickest ways to digitize business cards. In the news Amazon quietly releases two new Kindle models; Lenovo debuts an all-in-one desktop computer with a 29-inch display; Microsoft has a good week; Facebook expands its Graph Search results; Apple deals with more security issues; researchers develop a robotic prosthetic leg that is controlled by brain function; and Intelligent Glasses that can translate languages on the fly.